The Buffalo Sabres and Winnipeg Jets have come together on a massive trade that will send Evander Kane to Western New York. Also involved in the trade was unsigned goalie Jason Kasdorf who will be heading to Buffalo. The only thing more surprising about the trade than the sheer volume is the fact that Jets GM Kevin Cheveldayoff has actually made a trade involving significant NHL players. Let’s break this massive deal down, shall we? OK. I like the deal for both teams. I know it’s crazy but sometimes that kind of thing happens. 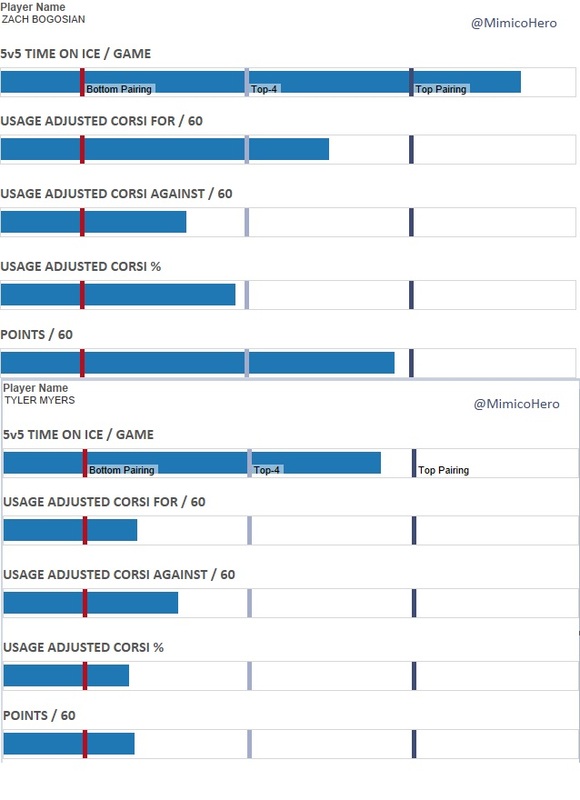 Tyler Myers and Zach Bogosian appear to be a wash in both on-ice output, contract terms, relative age and no trade clauses (both have one that kicks in next year). When reading these charts it is important to remember that Myers has been on some pretty bad Buffalo teams while Bogosian has been on a steadily improving Jets team. 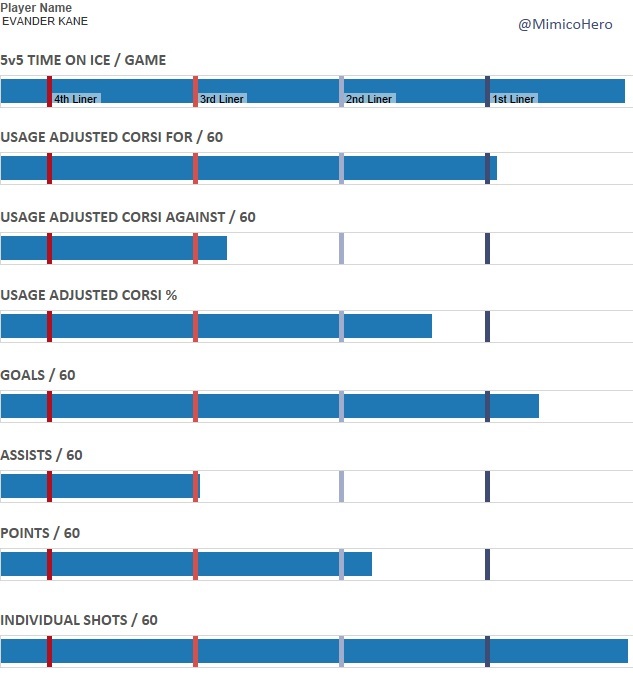 To try and break down their usage further we can look at their dCorsi numbers. I just want to stress a couple of points. dCorsi is useful for evaluating players incontext - particularly over the long term. If you wish to compare players in the best way possible using this data - compare players who havesimilar Expected Corsivalues, i.e. players who have been used similarly. Basically players with extremely high or consistently high dCorsi values are playing above their usage, while players with extremely low or consistently low dCorsi values are in over their head with respect to their usage. In either case, it should probably be adjusted if possible to improve how they are being used. A team that is being used "ideally" would theoretically have a dCorsi of zero (which is basically impossible due to the randomness inherent in the sport of hockey). After taking into consideration both of their situations I believe this part of the deal was a straight up trade one for one. Evander Kane needed a fresh start and he is going to get one with one of the more exciting teams to watch in the next few years. 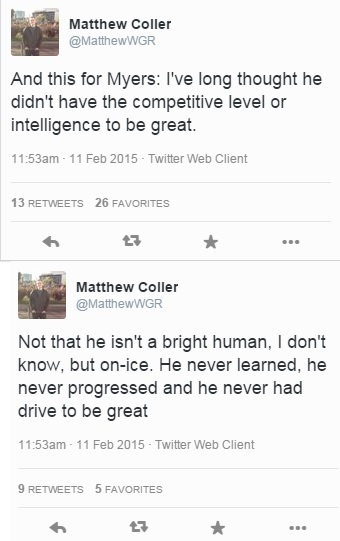 He will more than likely be centered by Jack Eichel or Sam Reinhart (or even Connor McDavid if he’s really lucky). I do believe he was in a toxic environment in Winnipeg which has blame on both sides. Much like other players who were traded for off-ice reasons (Tyler Seguin, Jeff Carter) I believe that Kane will do a great job in Buffalo. Buffalo has three first round picks this year, they have one from the Islanders because of the Vanek trade, one from St. Louis from the Ryan Miller trade, and their own which will be used on McEichel. The Jets will be getting the Sabres latest first round pick. For the Jets this is an OK asset and for the Sabres it was extremely disposable. Drew Stafford is a winger that can potentially help the Jets right now which is something they needed with the loss of Kane to surgery. Where this deal gets really interesting is how you value established talent (Kane) versus the value of prospects like Joel Armia and Brendan Lemieux. Joel Armia is a player with good size and very good hands. He has made a lot of positive strides playing in Rochester of the AHL this season. He has a chance at making an offensive impact at the NHL level. Brendan Lemieux is a player who is having a fine year in the OHL, he has 35 goals in 46 games (22 on power play). I am always a little leery of CHL goal scoring prowess as many players do not find the same success in the professional ranks as they do in juniors. 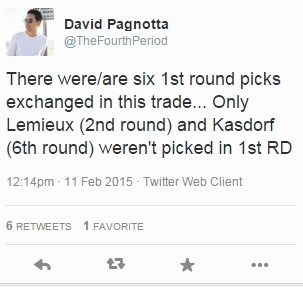 There is a decent chance Lemieux turns into a third line energy guy not an impact goal scorer like Evander Kane. What I really like about this deal for Winnipeg is that they get a guy like Stafford to help in the now. Stafford may not light the world on fire but what it will do is keep Dustin Byfuglien playing on defense where he definitely belongs. I also like how a majority of this deal is geared towards to bigger picture for Winnipeg. They were able to stay competitive in the now without compromising the future. Considering Winnipeg backed themselves into a corner with Evander Kane they did alright. For the Sabres this is just a genius move. They have so many assets in the form of draft picks and prospects that they can afford to spend a little to get a proven goal scoring machine like Evander Kane. The best part about this deal is that they gain an impact player that cannot play right now and will not compromise their well-planned tank job. Next year the Sabres could trot out Jack Eichel and Evander Kane in the opening night starting lineup, that is quite a turnaround from this past year. After this year the Sabres will not be tanking and eventually they will have to acquire impact players. 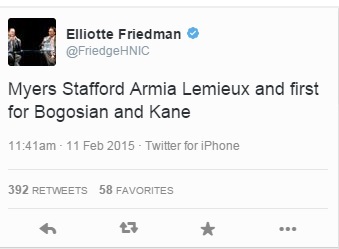 Acquiring Evander Kane certainly fits the bill. Buffalo is an awesome hockey market and they are chomping at the bit to be entertained again. With McEichel, Kane, Reinhart, Grigorenko, Ennis, and Moulson at forward along with Bogosian, Ristolainen, Zadorov, and Pysyk on defense they have the building blocks in place to hit the ground running next year while trying to compete for a playoff spot. You may be asking yourself, playoffs? Are you nuts? No I'm not. The Sabres will have at least 25-30M to play around with and no real free agents to lock up. They have a blank canvas and are starting to acquire all the hardest pieces to obtain when building a roster. Buckle up Buffalo. Tim Murray is about to have some fun.